Father and son are sitted in front of the big wheel in Paris. 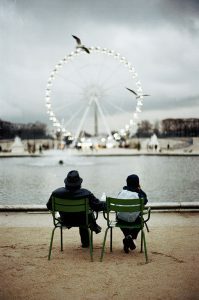 In the garden of the Tuileries, in front of the big wheel located Place de la Concorde, a father and his son are sitted on green chairs beside the large water basin and look in the same direction. Au jardin des Tuileries, devant la grande roue de la place de la Concorde, un père et son fils sont assis sur les chaises vertes au bord du grand bassin et regardent dans la même direction.